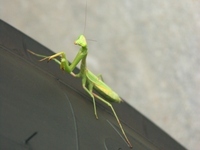 A funny thing happened to my front tire this morning ... a praying mantis looking for a ride. It was suggested that it might become a mascot (like the Geico gecko lizard) and travel North America with us. Great idea and we can call it the Praying Providence Mantis!